Those looking for the Lomprayah Office in Thongsala at the pier will be scratching their heads. It has moved, and is no longer at the pier near where the boats arrive and depart. But don’t panic – it is nearby. For many experienced Koh Phangan hands the Lomprayah Catamaran service is by far the best ferry option for getting to and leaving Koh Phangan. The catamaran’s are well maintained and comfortable inside. Moreover, they are the fastest boats plying the Gulf of Thailand. 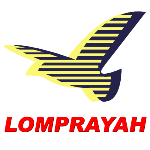 You can knock an hour off travelling time by using Lomprayah. For the few extra Baht the Lomprayah costs compared to other ferry companies, this is money well spent. The new Lomprayah office is near the Post Office in Thongsala. For the exact location see the map below. The office is well laid out. There is a counter to purchase tickets as well as plenty of seating for those having to kill some time before getting on a ferry. And, as you can see from the picture above, they have spent a bit of money on new signage! Where Can You Go with Lomprayah? Lomprayah has a range of destinations on offer. They team up with bus and plane companies to offer a wide range of travel options for those leaving Koh Phangan. Below are a list of destinations along with price and times. You can book online here and you can compare prices and travel times with other ferry companies. These are not the only routes that Lomprayah cover from Koh Phangan. You can find out more on their website or by visiting the Lomprayah Office. It is worth noting that while it is possible to get same day tickets sometimes demand outstrips supply during peak times such as the Full Moon Party and New Year’s Eve. The traditional summer holiday months also get very busy. Use the Search Box below to buy your tickets from Koh Phangan to Bangkok. Secure online booking and instant ticket confirmation. After booking you will be sent an E-Voucher which you then exchange at Koh Phangan Ferry Port for your tickets when you check in. The 08.30 departure from Koh Phangan with the Lomprayah Company is the best one to book if seats are available. The 08.30 departure arrives at the mainland ferry pier near Chumphon at 12 noon. You get an hour to relax at the ferry port, which is on a pleasant beach, and have lunch before boarding the bus to Bangkok. There are a number of services plying the short route between Koh Phangan and Koh Samui. Tickets for all of the ferry services listed above can be purchased online using the search box below. Tickets for most services cost the same amount as they would be if purchased at the ferry pier on the day of travel. The Lomprayah ferry is slightly more expensive but the service is also slightly better than the Seatran. Large items of luggage are taken on and off the boat by the staff and the seating on the Lomprayah ferries is better and there is more of it. Use the Search Box below to find your tickets from Koh Phangan to Hat Yai. Booking in advance makes sense because of the early departure times for many of the services. This services goes direct to the centre of Phuket Town. Book early if you want to take the 07.20 departure as these tickets often sell out. The 12.00 departure, which arrives at 19.40, is the less popular option. Ferry to Donsak Ferry Port on the mainland. Luxury bus direct from Donsak Ferry Port to Phuket Town. Tickets on all the three services from Koh Phangan to Krabi listed below can be purchased online using the Search Box below. This service starts with a ferry service from Koh Phangan to Donsak, however, the ferries Lomprayah use are high-speed catamarans and they travel much faster than the Seatran boats. The ferry journey takes around 1 hour 15 minutes and the overall journey is about 1 hour faster with the Lomprayah service, although the ticket price is 100 THB per person more expensive than the tickets sold by the Seatran Discovery Company. Use the map below to find the Lomprayah Office. It is just a few minutes walk from the ferry pier.